Hi there, friends! I have another essential oils con tent pack that I think you're going to like. 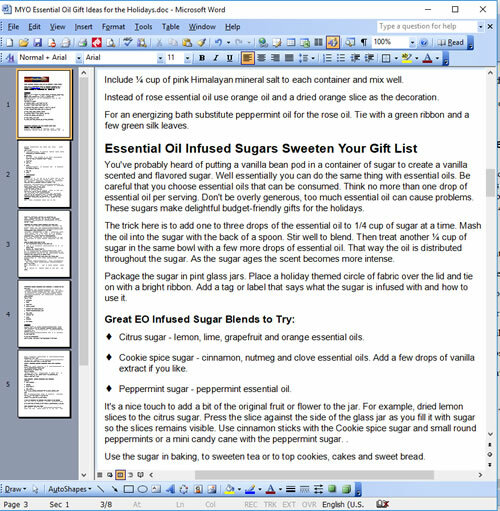 This one covers essential oils PLR blends and recipes for you to share with your readers. I originally marketed this for the holidays, but my list was pretty smallish still then, so not a lot of folks knew. Plus, the content works easily for any time of year gift-giving. Think birthday, housewarming, wedding shower, get well, or just because. My friend Dee Power wrote this content, and she's very talented! You can use it to educate your readers, host an essential oils class, publish in your newsletter, share on social media, make an ebook to sell or share, and more. Essential oils are hot with the health and wellness crowd right now. People just want to get back to clean, healthy basic living and oils have proven aromatherapy benefits. This is also a time when folks are looking to save money and don't want to throw their earnings away on overpriced mall gifts. So give them what they'd love to read about... a flurry of creatively inspired, homemade holiday gift ideas that they can create using just a few simple ingredients and their collection of essential oils. 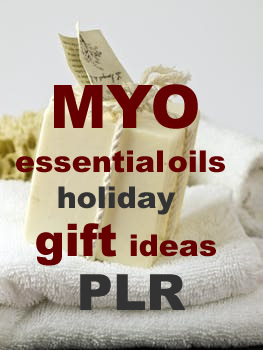 PLR Essential Oils recipes for homemade gift ideas. Perfect to share with your list of DIY makers and crafters, healthy moms, and holiday readers. Ideas for sharing include turning into an ebook that you can sell or give away for free, sharing in your newsletter, and publishing in your blog along with Amazon links to supplies for some great holiday affiliate income.